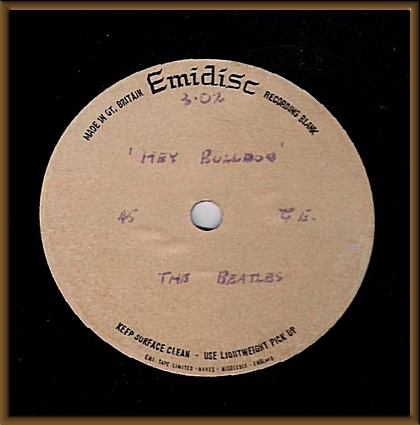 Now HERE is a rare Beatles collectible, an original UK EMI Records mono 10" Acetate (one sided) of a slightly different Mix/EQ of "HEY BULLDOG." This acetate comes with a certificate of authenticity from Perry Cox, world famous Beatles expert and author of "The Official Price Guide To Beatles Records and Memorabilia." (See this reproduced below--I have blurred Perry's address on the scan only, it appears on the actual COA.) As with everything we offer it is guaranteed authentic with no time limit. This came from an extremely large and long term European Beatles collection, and is as you might imagine incredibly rare. Ken Scott, the legendary record producer and Beatles engineer told me the following about Beatles acetates: "Back in those days there were no cassettes, DATs or CDs and so the main way for artists and producers to be able to listen to something at home was through playback acetates. The number required varied. As did the persons receiving them. It could be producer, artist, arranger, publisher, DJ or sometimes even a promotion guy." 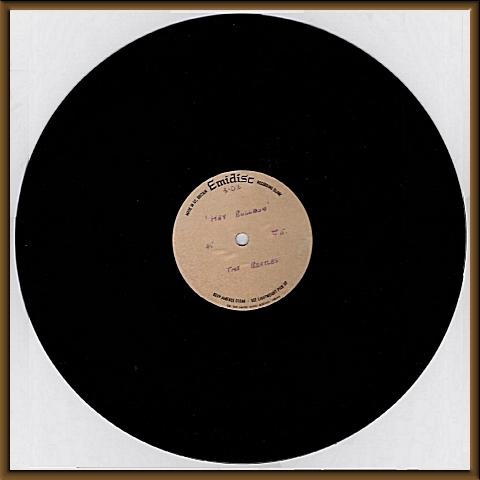 In addition, acetates were cut to send to international affiliates, so they could hear the upcoming releases. As you probably know if you've read this far, authentic Beatles acetates are very few and far between. An extraordinary opportunity !